I have a really easy nail art mani for you tonight featuring some water decals from the Born Pretty Store again. These adorable little corsets are so simple to create. I started with a very sheer pink base - Bourjois Rose Lounge. I then painted each nail in two strokes from about 1/3 of the way down using Picture Polish Candy. This formed the shape of a love heart at the top to form the top of the corset. Next I used a fine dotting tool and some black polish and did small dots along the top edge of the corset. Lastly I put the water decals on and sealed it with top coat. 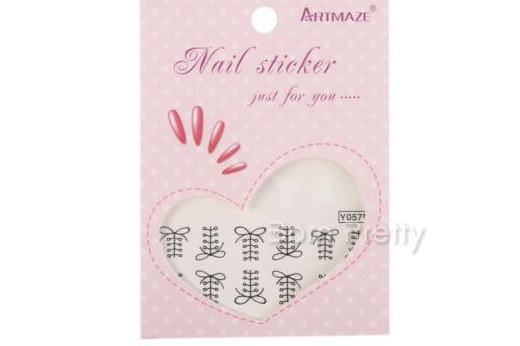 This is the package of lace up water decals (design Y057). You get 12 black and 12 white lace up designs. I'm still working on a design to use with the white lace ups. These water decals were really easy to use. I only needed to soak them in water for about 30 seconds and they slid straight off the backing. There were a few that I put into the water and I accidentally left them there for longer than they needed and they floated to the bottom of the water container. But the good news is that they are strong enough to hold their structure on their own. I just gently grabbed them with my Mont Bleu tweezers and positioned them on my nail. Once you are happy with the location on your nail, blot them with a tissue to ensure all the moisture is gone from underneath the water decal. Then finish it all with some top coat. Even though these decals are thick enough to hold their structure, they still have invisible edges when placed on the nail. I really love these. Here is my Born Pretty Store coupon code again in case you are looking for a bit of a discount - NMPG10. pretty, but they look more like lace up boots!